Preparing for the NCLEX is the ultimate goal of nursing school. You go through an intense program to be eligible for your state boards. Statistics show that if you don’t pass your NCLEX the first time, your chance of passing it the next time drops significantly. There are hundreds of study guide out there with new editions coming out each year. Using every NCLEX book out there would be impossible and cost you a fortune. NCLEX-RN Premier 2015-2016 by Kaplan is one of the most well-known books in the industry. It includes an online practice test as well as an in book test. Giving you the option to take one with you on the go, as well as sit down like it’s an actual NCLEX exam. The questions are put together by some of the best in the industry and are designed to get you thinking like a safe practicing nurse. A 60 minute DVD is included and will give you added tutorials and strategies to pass one the first time! 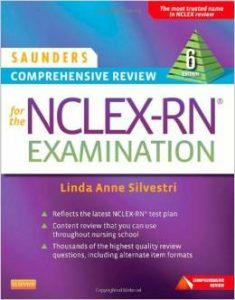 Saunders Comprehensive Review for the NCLEX-RN Examination, 6th edition gives you one of the best values for an exam book. The book contains over 5,100 NCLEX style practice questions. A unique study guide is available for each chapter to refresh you on the content covered in school. When taking practice questions, Saunders provides detailed rationales to explain the critical thinking process. When two answers can be correct, how do you pick the best answer? A CD Rom is included with computer based questions to give you the computer test taking feel. This is by far one of the best NCLEX Exams books for 2015 test takers. 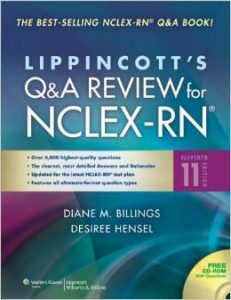 Lippincott Q&A Review for NCLEX-RN with CD is another great choice when it comes to NCLEX preparation. This book contains 6,000 NCLEX Style test questions which is the most seen in any NCLEX book. Questions range in all difficulties so you can practice your base line knowledge as well as you’re in depth critical thinking. Rationales are provided to get you understanding at a higher level. These quality NCLEX practice questions will prepare you to pass the exam the first time! These three books give you some of the best quality questions and rationales for your dollar. You may be hesitant when deciding to purchase one of not, but remember. You want to pass that exam the first time! When that exam hits 75 questions and shuts off, you will be confident that you earned that passing grade.